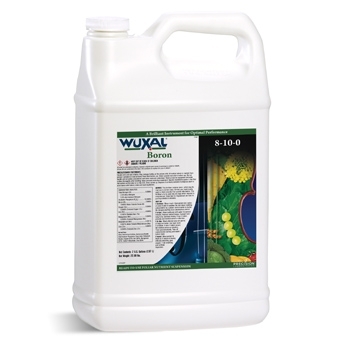 Wuxal Boron is a suspension foliar fertilizer for efficient uptake of boron into leaf tissue. Wuxal Boron is recommended for conditions conducive to boron deficiency. The boron in combination with chelated cationic elements, aids in the prevention of other hidden nutrient deficiencies. Wuxal formulations include adjuvant technologies for spray solution buffering, spray characteristics, leaf wetting and leaf surface retention. Pre-flowering, during periods of cell division & fruit enlargement and post harvest. Boron deficiency, improved fruit set, higher yield and fruit quality, & reduced flesh browning of Conference pears during CA-storage. Post harvest, before leaf drop and dormancy. Boron deficiency, improved bud development, fruit set and yield. At 14 days after transplanting or onset of vegetation & beginning of differentiation of flower buds. Improved size of buds and increased yield. From start of flowering through fruit set. Improvement of pollen germination, yield and improved fruit set for the subsequent season. Before bloom and during fruit set.Prevention of boron deficiency. Improved berry set & berry size. Reduced risk of coulure (poor setting). Bud burst until pre-bloom, pre-bloom/bloom and post harvest. Improved pollen germination, fruit set and bud strengthening. At 4-6 leaf stage, 6-8 leaf stage & shortly before closure of rows. Prevention of hollow stem. Increased sugar yield. Spring greenup and 10-14 days after each cutting. At 4-6 leaf stage and at end of the first flowering or fruit set. Prevention of boron deficiency. Improved fruit set and yield. End of dormancy, before and during bloom. Prevention of boron deficiency and fruit deformations. During formation of side shoots and at flowering. Prevention of boron deficiency and improved nut set and yield. Two weeks after tuber initiation & 4-5 weeks after tuber initiation. At 10-11 leaf stage, bud formation and early bloom. Prevention of boron deficiency. Pollen fertility and pod set. Stem elongation and inflorescence emergence. Prevention of boron deficiency. Higher yield and oil content. At 4-6 true leaf stage and at beginning of root expansion. Prevention of boron deficiency and increased yield. Prevention of boron deficiency and higher yield. At first square and during flowering. Prevention of boron deficiency and to aid plant health during dry soil conditions.